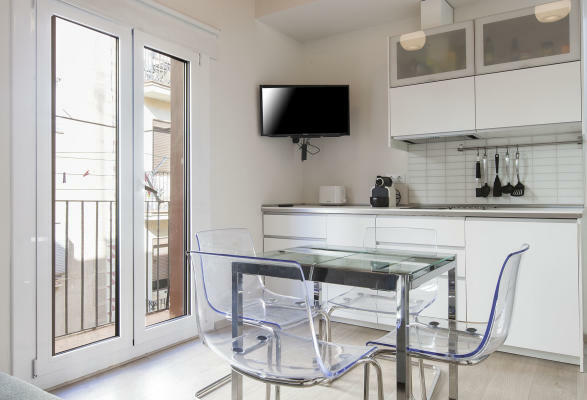 This recently renovated apartment can be found in a lively area, just steps from the Barceloneta beach. It is situated in a great town, ideal for those looking to spend an extended period of time in the city. You´ll find plenty of supermarkets and bars near to the apartment, as well as shops and restaurants. You can reach Downtown Barcelona in just 15 minutes on foot, and there is a good connection to the rest of Barcelona by public transport. This two-bedroom apartment has sea views from the balcony. It has a double bed and one single bed, making it ideal for couples or small families. The bathroom is very modern and has a walk-in shower, while the kitchen has a stove, coffee maker, kettle, blender and toaster. There is also a washing machine and iron for your convenience. With central heating and air-conditioning, this is a fantastic Barcelona home, at any time of year.